Sugar addiction grips many people in America, so you are not alone in your struggle. Most of us either walk around with a sugar buzz or anticipate our next opportunity to score a sugar fix. When we douse our morning brew with our favorite flavored creamer, we awaken the sugar beast. As the day progresses, the fight continues between our sugar-addled taste buds and the sugar beast. The food industry helps to feed our inner sugar beast with refined foods like bread, condiments, snacks, lunch meats, and beverages. I think we can all agree that sugar does not contribute to our health. Would you like to heal your body from the harmful effects of sugar? Take the next right step toward investing in your health. Implement some or all of these strategies to help you manage your sweet tooth (sugar addiction). Take a minute to recall the last time you attended a wedding or dinner party. What attracted your attention as you circulated the food table? If we are honest, the hummus and veggies pale in comparison to the frosted creation tempting us to skip dinner and race at break-neck speed to grab dessert. How did our love affair with sugar start? Dr. Sherry Pagoto explains that the amount of sugar we crave has been conditioned by the food industry, our early family experiences, and our food choices. A warm feeling envelopes me when I recall early morning childhood breakfasts of Frosted Pop Tarts with the lovely rainbow sugar crystals sprinkled on top like pixie dust. I washed the main course down with a tall glass of Tang or frozen concentrated orange juice. After happily finishing every morsel, I skipped off to school. As an adult, I shake my head when I look back at those fond sugar laced memories to where I am today with my breakfast routine. For years, though, I associated breakfast with refined carbohydrates and processed foods. Until my diagnosis of acute Lyme Disease, I thought I maintained a healthy diet. After my diagnosis, I needed to subdue the disease with my fork. My diet needed to radically change which meant paying close attention to my daily intake of sugar. Honestly, even before my diagnosis, I didn’t battle with a sweet tooth, but my diet contained sugar from inconspicuous sources like ketchup, pasta sauce, yogurt (even healthful yogurt). Sugar disrupts the healthy environment of your gut bacteria. Remember our gut consists of a balance of “good bacteria and “bad” bacteria. Think of the bacteria like a truce between the Hatfields and the McCoys, a delicate co-existence that we do not want to disturb. A diet full of refined sugars fuels the bad bacteria until a war with the good bacteria ensues. What’s driving your taste buds to the sweets? Stress, hormonal imbalance, or digestive issues (a.k.a. gut issues) elevate your desire for sugar. What is going on in your life at the time the sweet tooth demon appears. Prevention magazine editorial director Anne Alexander recommends “the first step to breaking that emotional connection to sugar is to become aware of the feelings that drive you to it.“ As you stand in line to order your morning coffee, consider why you have a stare down with the glazed doughnut. If you are hungry, then scan the menu for real food options. Certain restaurants or activities may heighten your desire for sugar. For example, some people need to buy a box of candy every time they go to the movie. If you are trying to kick the sugar habit, does this mean you refrain from going to the movies? Maybe, for a while until you get your sugar cravings under control. While you are crushing your sugar addiction, consider bringing a treat to social events. Reach for snacks made in nature that are high in protein and healthy fats like raw trail mix. The most challenging place to resist sugar is at a family or church function. I encourage you to start bringing desserts sweetened with real food, nature-based ingredients like dates, honey, maple syrup, or stevia. Whether you drink diet soda or the sugar-fueled regular soda, there are no nutritional benefits in the beverage. Instead of drinking soda switch to plain sparkling water and add pureed fruit, sliced fruit, or fresh herbs. Sparkling waters like La Croix are tasty beverages without added sugar. These serve as a healthful transition or substitute for soda. Journal-the next time you have a few quiet minutes, take some time to consider what prompted your sugar craving. When a craving for double chocolate cupcakes emerges, journal your thoughts using just keywords, not complete sentences (because you want to get your thoughts down as quickly as possible). Plan for the unexpected by creating an emergency stash of real food to use instead of a high priced grab-n-go snacks from the gas station. 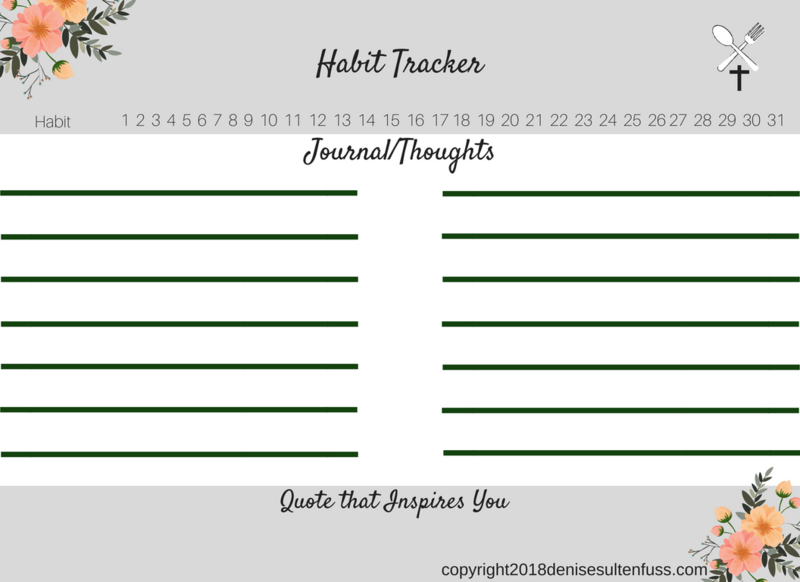 Use my habit tracker and journal printable to help you monitor reach your goal to go “no processed sugar” for a month. Restructure your breakfast menu. If you normally eat sugary cereal for breakfast, try a breakfast bowl filled with vegetables and protein to fuel up your body. Aspartame (NutraSweet, Equal, Spoonful, and Equal-Measure) is a chemical. This artificial sweetener is not the new kid on the sugar substitute block. The powdery sweetener is the subject of food controversy. Play it safe by using a real food barometer: is the food in question sweetened by nature, if not, then avoid the food. Food manufacturers insert sugar in the most unlikely foods. As a responsible consumer, read your food labels to avoid unnecessary sugar. After successfully reaching your no-sugar goal, reward yourself with a non-food treat. Determine what your reward will be before you begin your no-sugar habit and record it in a journal or on a habit tracker. Maybe a movie or a new a book motivates you? Stevia (Stevia extracts and stevia leaf NOT Truvia or any form of powdered stevia. A necessary change in your eating habits is imminent. You know that. Change is scary and hard; I know that too. You don’t have to do it alone. Connect with a group of people who will encourage you during this challenging time. Join my holyandhealthyliving Facebook group and post your progress. We will high five you, pray for you, or offer you the next right step. Decide to blaze a new trail in healthy living by kicking your sugar addiction or sweet tooth habit. Great information, I cut out sugar a longtime ago and I can not even believe all they ways they hide it under different names and in things it doesn't even need to be in. It is so true how food manufacturers trick our palate into thinking it needs sugar.